Fourneyron, the former French Minister of Sport, made the assertion during an update on the ITA’s progress at the International Olympic Committee (IOC) Session here. She claimed that, while the ITA had enjoyed positive meetings at events, such as the SportAccord Convention, the organisation were concerned that some NADOs and IFs viewed them as a competitor. "An area of concern involves the defensive approach from some IFs and NADOs," Fourneyron said. 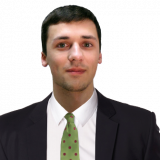 "Outsourcing anti-doping function to the ITA means accepting to relinquish a certain degree of control and some human factor regarding some existing administrators dealing with anti-doping within their administration. “Some NADOs see the ITA as a competitor or as a body that is not as independent as them, therefore they do not yet advocate support to the ITA. “To those entities I say it is important that they keep an open mind and approach the fight against doping with vision and ambition. “The future of anti-doping is not in isolation, but rather on information sharing and focusing our efforts on our common goal – clean sport. “This is why the ITA needs to find a way of maintaining its balance of independence, while keeping close ties with its partners to ensure proper sharing of expertise and information. “Sport specific expertise needs to feed the ITA’s operation as a key to successful operation. The composition of the ITA board had raised eyebrows regarding its independence as three of the five members are direct representatives of the Olympic Movement. This was defended by ITA director general Benjamin Cohen in March, who stated that the Board would not be involved on a day-to-day basis and their primary responsibility would be to define strategy and set budgets at an annual meeting. It was claimed that the ITA would have complete control over how, when and with whom they conduct tests within a specific sport. During her presentation, Fourneyron admitted that organisation faced several challenges over the coming months that would need to be resolved. Among them was the ability to build a structure which could scale up for major events, while having sufficient resources to deliver regular operations for partner organisations, whom they would work with all year round. Ensuring the ITA can maintain the same level of service despite instances of increased demand was highlighted as key. Following highly publicised incidents of hacking, including on the World Anti-Doping Agency (WADA), Fourneyron stated that IT security was another area they were looking to address. Defining a pricing model for services is another area of priority, with the aim of helping ITA break even in the future. Fourneyron praised the close relationship the organisation has with WADA and stated they had begun preparations to support them with the analysis of samples obtained from the Moscow Laboratory. Access to the laboratory and the data stored there must be granted by Russia by December 31 as part of the agreement which saw the Russian Anti-Doping Agency reinstated last month. The ITA are also set to support the IOC’s reanalysis of samples from London 2012, with the organisation expected to continue their involvement in this process for future Olympic Games. Fourneyron citied that one of the benefits of the ITA would be the “absolute confidence” of athletes and the public over independence. She highlighted that the organisation has grown to now have 18 members of staff, having only officially stated operating in June. 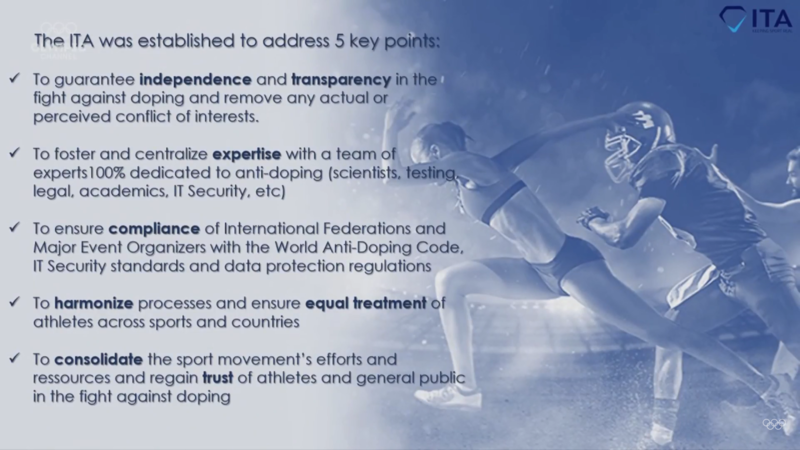 This process included the transition of the former Doping-Free Sport Unit of the Global Association of International Sports Federations into becoming part of the ITA. The ITA chair said she was hopeful of adding further staff to bolster the organisation’s capabilities in investigation and education. Fourneyron stated that the ITA had a total of 30 international partners. World Taekwondo signed an agreement to hand over its anti-doping programme to the ITA earlier this week.